The main types of lesser-toe deformity (LTD) are listed in this table; some presenting LTDs may show the features of more than one type. LTDs may be fixed (due to joint pathology) or flexible (due to soft-tissue contracture). 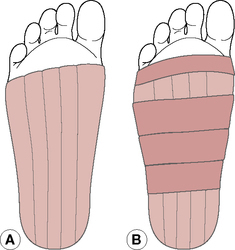 LTDs may characterize neurological and skeletomuscular diseases, hallux abductovalgus, hallux limitus/rigidus, compensation for excess pronation at the subtalar and midtarsal joint, and pathomechanical anomalies in the foot and lower limb. Hyperkeratotic skin lesions develop in areas of exposed digital or interdigital skin that are subject to excess pressure and/or friction, as the result of the toe deformity and shoe trauma. MTPJ, metatarsophalangeal joint; PIPJ, proximal interphalangeal joint; DIPJ, distal interphalangeal joint. Note: To aid retention, strapping should always be cut to create a smooth outline (e.g. corners are rounded) and applied firmly allowing for digital movement – unless the intention is to provide a soft splint to rest the part. Figure 1: Bow strapping. A: Application of longitudinal straps B: Overlaying of transverse straps. This article was published in Neale's Disorders of the Foot, Lorimer, French, O'Donnell, Burrow, Wall, Copyright Elsevier, (2006). Figure 2: Mask: several layers of adhesive strapping with a central hole into which a caustic ointment is placed (A), overlain by a cavitied felt pad (B), strapped into place (C). This article was published in Neale's Disorders of the Foot, Lorimer, French, O'Donnell, Burrow, Wall, Copyright Elsevier, (2006). Parekh, "Lesser toe deformities," Journal of the American Academy of Orthopaedic Surgeons, vol. Foot exams to identify hallux valgus, lesser toe deformities and plantar soft tissue atrophy were conducted between 2002 and 2008. Results show the prevalence of bunions, lesser toe deformities and plantar soft tissue atrophy was 31 percent, 30 percent and 28 percent, respectively. MARX RM: Anatomy and pathophysiology of lesser toe deformities. Toe deformities, such as hammertoe or claw toe, also can lead to corns. For both feet, detailed information was recorded with regard to ulcer size and aspect, dryness of the skin, foot and toe deformities, callus formation, fissures, edema, redness and increased temperature. When indicated, surgery to reposition bones may prevent arthritis or toe deformities in the future. Mann R, Coughlin MJ: Hallux valgus and complications for hallux valgus and lesser toe deformities. Compression of a child's toes when the shoes are too tight can lead to toe deformities. Lesser toe deformities are caused by alterations in normal anatomy, which create an imbalance between the intrinsic and extrinsic muscles of the foot. This poor fit can lead to toe deformities in many women. The pathophysiology of lesser toe deformities is complex and is affected by the function of intrinsic and extrinsic muscle units.